King Lear. Dir. Peter Brook. Perf. Paul Scofield, Anne-Lise Gabold, Ian Hogg, Cyril Cusack, Susan Engel, and Tom Fleming. 1971. DVD [PAL, Region 2 Format]. Uca, 2005. “Shakespeare: Drama’s DNA.” Perf. Richard Eyre, Peter Brook, and Judy Dench. Dir. Roger Parsons. Changing Stages. Episode 1. BBC. 5 November 2000. Videocassette. Films for the Humanities, 2001. 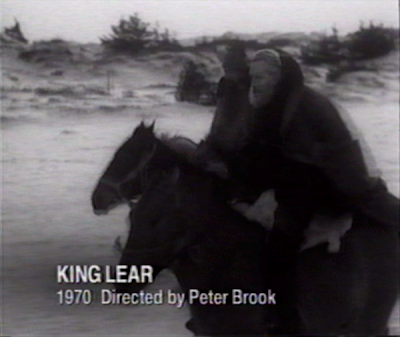 Peter Brook's film version of King Lear hasn't been released in DVD in American markets. But I discovered a small segment on the videocassette that presented a short clip of Peter Brook's 1970 stage production of Midsummer Night's Dream. It's starting to become something like Rare-and-Interesting-Clips-of-Shakespeare-Productions Week at Bardfilm! Wonderful! Thanks very much for calling our attention to that link! "Now is the winter of your discontent!"